I felt like I needed to post a project thread. So this is my "Project G". I shall name it Geoff. It's a 1989 Mayfair 998 auto. It was also yellow once (still is in some places), no idea why it's white now though. I'll definitely be changing that back to yellow, maybe with a black roof. Bought this 4 years ago for £400 (epic bargain), but couldn't really afford to work on it. Now I've saved up some cash I can finally start the project. Trouble is, I don't have much free time to work on it, so this'll no doubt be a slow process for a while. I've set up a gallery on imgur of its current condition. 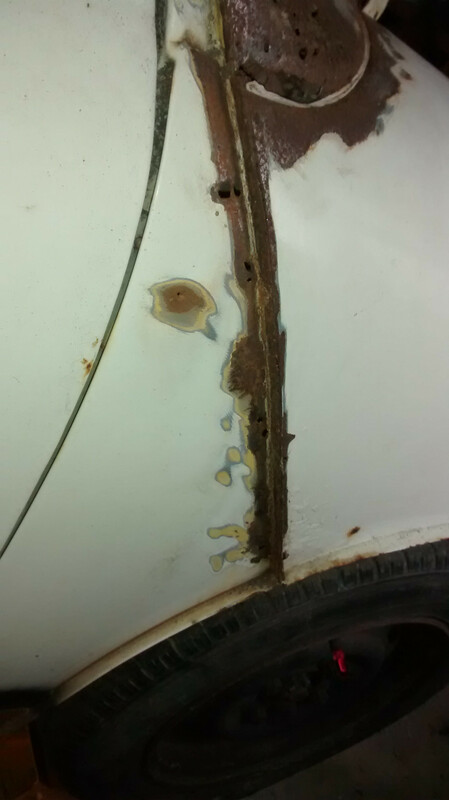 http://imgur.com/a/m6ij9#0 It shows the general condition and the amount of rust on the bodywork, no underside pics yet though. Overall, it's pretty solid, just the front end needs some work and a small amount of welding in some other places, oh and the engine. wow. I have no idea what happened to that engine though, I don't even know what to do with it. I'll hopefully be fitting a 1275 in there anyway. Expect me, at some point, to post some "I don't know what I'm doing" threads in the Tech Section. Looks like a nice project ! Good luck ! So I bought some things. Still need to buy a front panel and that patch for the roof, then I need to pay someone to fit the panels, because I don't trust myself to do that. Also on my to-buy list is a 1275 auto engine with high lift cam, though I might have to wait for my premiums to come down before fitting that. I'm not converting my Mini to manual, I don't really see any point in that. Still, I'm hoping to get this old engine running again, there isn't much wrong with it that I can see. The head is a mess though so I'm replacing it. I was told when I bought it that it was just the head gasket that needed replacing, though after 4 years of sitting unused, I think a few more bits need replacing now. The new HT Leads are just for a cleaner look, nothing wrong with the old ones. 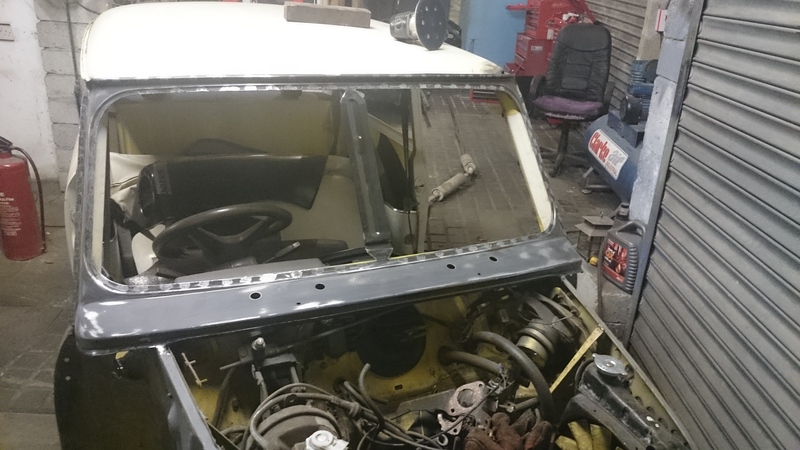 All of the electrics seem to work, other than the non existent wipers. The indicators and hazards are a bit lazy though, they take their time to get going. I also accidentally bought 2 oil filters (got a bit carried away), not that it really matters. 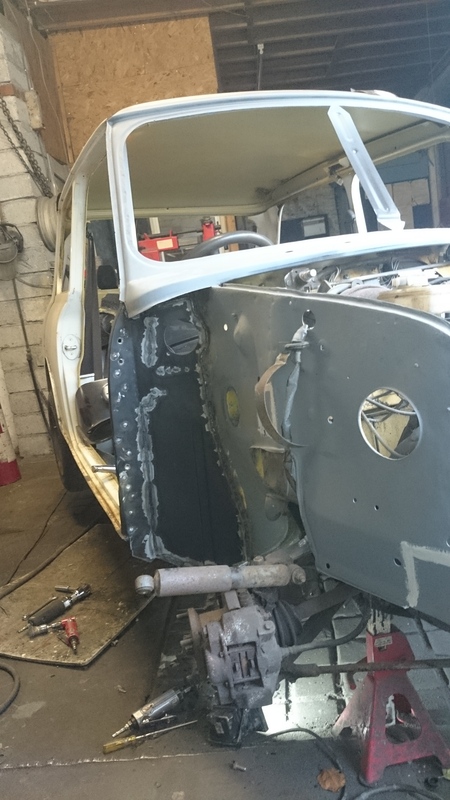 The only work that needs doing (that I can see anyway) is the front end (roof, R/H Scuttle, Wing and A Panel, windscreen, passenger door window regulator and skin, front sills and floor), clean Rear Subframe, brakes, rust treatment, wipers and putting the engine back together, oh and that awful paintwork. Cosmetic stuff will come after all that is done. I'm aiming to get this on the road for the IMM, which I should probably buy a ticket for. Edited by Skable, 11 May 2014 - 10:55 PM. I think I bought more than I needed. Engine's knackered. No matter though, just means it's gonna have a 1275 now. Insurance might be expensive, but I'll just have to live with it. Fitting that is next on the list, after removing the old lump. Then it'll be sent off for some welding. I haven't made a to-do list, I should do that. 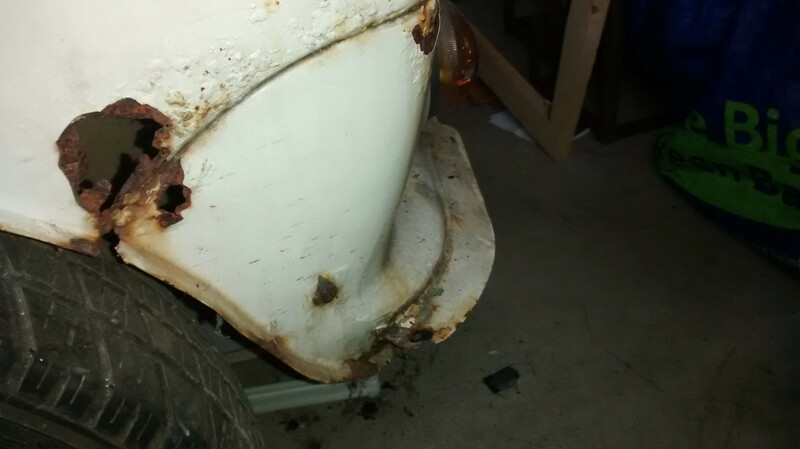 Rear panel - some patches of rust to be welded. Exhaust to be replaced - stage one kit if the 1275 doesn't already have it. Brakes - Seems to be a blockage somewhere, replacing hoses might fix that. Front and rear brakes to be replaced with newer ones. The brakes are old, I don't trust them, especially with the 1275 being modified. indicators and hazards need adjusting - they work when they feel like it. Wiper motor might be shot - attempt repair, replace if necessary. Mini was debadged, I prefer it to have badges. Dashboard is a disgusting brown, don't like. Maybe fit a better stereo and speakers. Though I might not bother with that. Edited by Skable, 20 May 2014 - 11:01 PM. 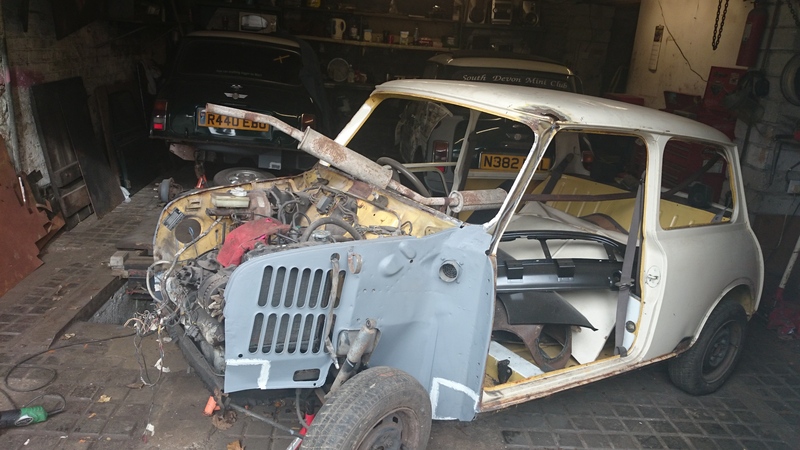 So this is now in the workshop being restored back to its former glory. There's more work to be done than it looked before, but still not bad. I'll have to take some pics of the progress. Floor flattened (had a small hill in the passenger footwell.) Don't jack the floor. Wasn't me who did it though, I only noticed it after taking the seats out. Rear brakes bled and working perfectly, no need to replace them after all. Will change the front brakes after the welding's been done. 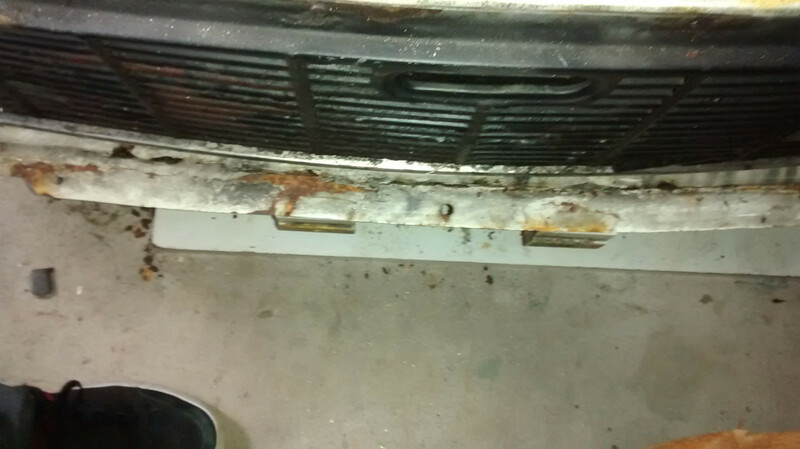 Both doors are rotten and will need replacing or reskinning. I have acquired a driver's door, but still need a passenger door. I do have a skin as a backup though. Bought a few more things too, bumpers, spare wheel, new door locks, exhaust and spotlights. Just missing a windscreen now, though I might also change the odd headlights (one's blue and the other's clear, as shown in the pic above). Oh yeah and a van grille, I want a van grille. This should hopefully be on the road by February. Edited by Skable, 07 November 2014 - 12:48 AM. Whole front end was rotten and I think somebody shot the roof with a laser. 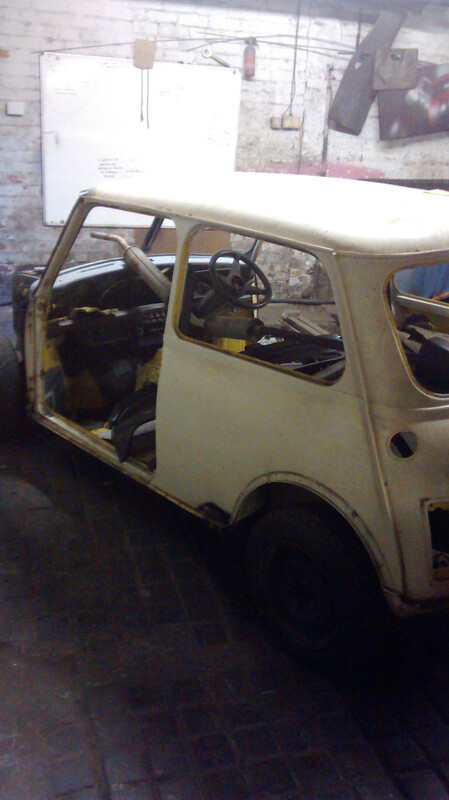 and what it's currently like..
New windscreen panel, scuttle, dash rail, inner wings and flitches fitted so far. 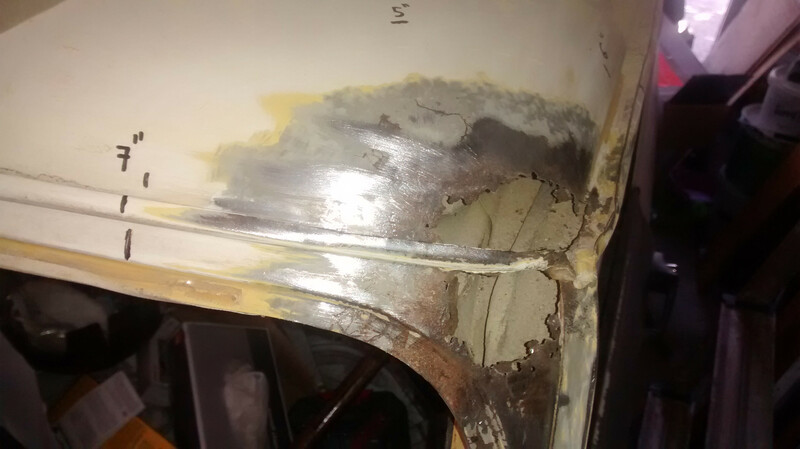 Bulkhead has also been repaired. I've come to realise how much I love the black steel wheels, definitely gonna keep those now and get them powder coated. I also need to take better pictures. Edited by Skable, 07 November 2014 - 06:08 PM. Just a brief update. I've acquired a 998 manual engine. 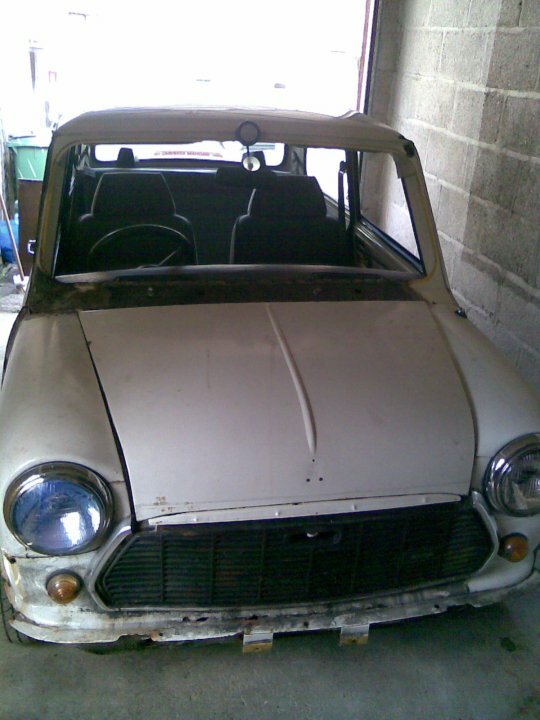 I realise that autos are somewhat rare, but this isn't a mini to sell, it's a mini for me to have fun with. I've never driven an auto and will probably not feel comfortable driving one, so I think the manual is the better choice for me. A lot more welding is to be done, but I'll be swapping the engine next week. 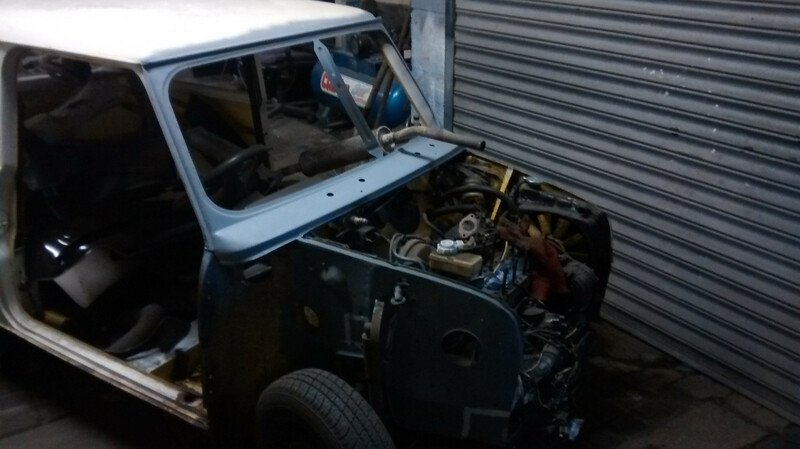 Hopefully I'll finally have a running mini by the end of the week. The exhaust I ended up buying is not an RC40, I actually have no idea what it is at all. It's a large bore exhaust that looks a bit like a Peco or a Sportex. 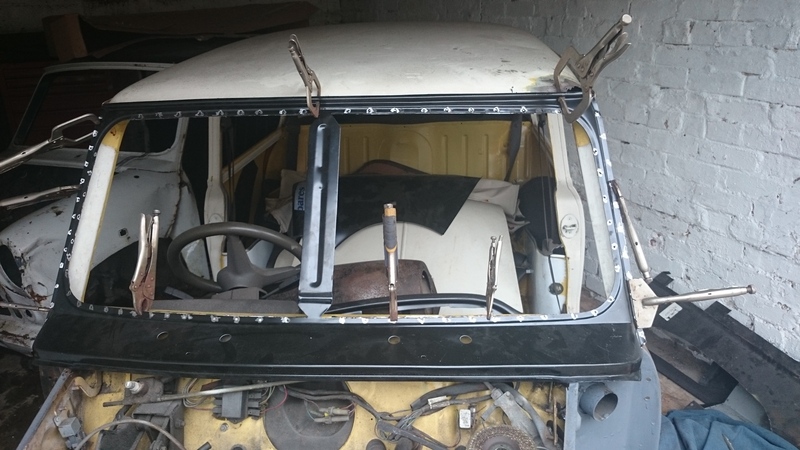 I also now have all the trim and the windscreen and opted for a van grille. Couple more pictures from JG Welding. I'll take some more of my own next time I go up. Not a lot left to do now. It's also had new door steps since these were taken. It's been delayed due to other jobs coming in, but it's getting there. 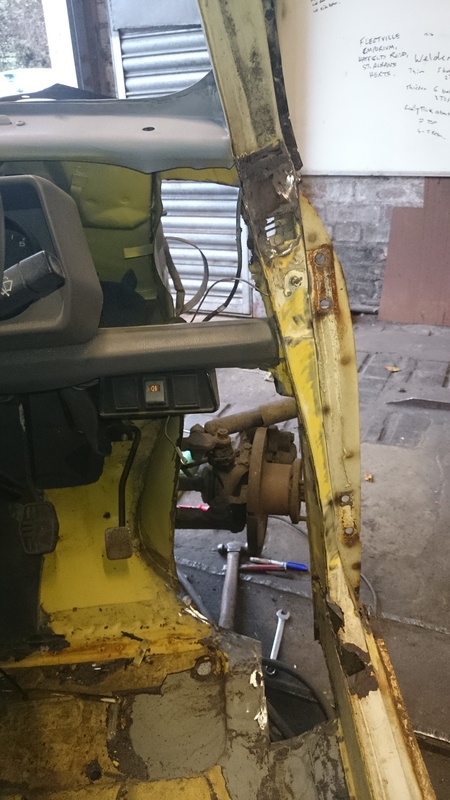 The boot floor is solid, so no work needed to be done there and the same for the underbody which has also been stone chipped. 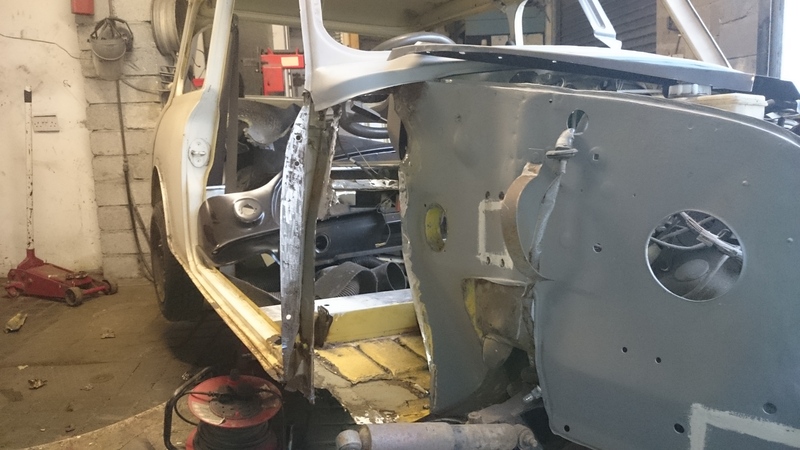 Rear subframe has been dropped, cleaned and repaired and is ready to go back on. Oh and I also have a windscreen and a spare rear screen now, paid £16.90 for the pair. Edited by Skable, 22 February 2015 - 01:29 AM.